Governor Perry’s decision to not seek another term as governor allows for an opportunity to consider term limits. At the moment I am undecided on the matter for reasons I will explain below. But first, I think it is important to reflect on two instances in U.S. history that frame the term limit debate for executive officeholders. Prior to the 22nd Amendment (1951), U.S. Presidents could serve as many terms in office as they could convince voters they deserved. FDR was the impetus of this amendment as he was voted into office four times thus disrupting the understanding that presidents would follow Washington’s example and not seek more than two terms in office. George Washington followed the example of the Roman statesman Lucius Quinctius Cincinnatus and left office after serving two terms. Cincinnatus—the namesake of a private officer’s club Washington was a member of—was called to service when Rome was invaded. He assumed the role of dictator until the tribes that had invaded Rome were defeated. Once they were defeated, Cincinnatus relinquished all authority and returned to his plow. Because he had the support of the people and the military, he could have ruled indefinitely, instead he is remembered as an exemplar of civic virtue and modesty. Most of our politicians are not of Cincinnatus’ character or demeanor. Elected officials fight with everything they have to stay in elected office—either the one they currently hold or the next one up. Eliot Spitzer and Anthony Weiner in New York show how hard it is to leave public life even when publicly disgraced. Whatever the attraction, and whatever the motivations, the lure is irresistible to a few. This is where term limits come into play. Because of the advantages that come with incumbency, once elected, the motivated politician is nearly impossible to defeat in an election. Even mediocre incumbents generally do not have a tough time winning reelection. This causes some concerned citizens and activists to call for term limits. The thought is that if there were term limits, we would have a better opportunity of getting politicians into office who will be more likely to serve the public good rather than their own private interests. With no possibility of serving indefinitely, and no pressure for reelection, politicians within a term-limited system would be able to work single-mindedly for the people rather than the select few. My concern is that the exact opposite would happen. If a person is willing to take bribes or look to set himself up in the private sector after public office, a term limit would offer him the perfect opportunity to do so. If an official does not have to worry about going before the voters for reelection then the official will be beholden to no one except his own interests, ambitions, and desires. This assumes a dim view of human nature of course, but no one who endorses term limits can have a particularly positive view of human nature—or at least the nature of elected officials. There is a more fundamental objection to term limits that I embrace. Voters should get the government they deserve. If voters do not care enough to show up and get a bad politician out of office, then they deserve that bad politician. 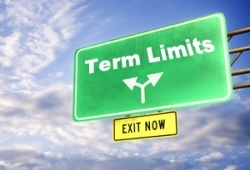 Term limits seem to be little more than an appeal for the government to intervene in the free choice of voters to choose the government they want. If the voters do not do enough to inform themselves, then it is not the government’s place to step in and save them from themselves. My attachment to freedom and liberty, and fear of government intervention and regulation, means that I find myself opposed to term limits although open to the idea. But let’s not confuse the matter. Perry didn’t decline to seek reelection because he was motivated by civic virtue. He is no Cincinnatus or Washington. His eye is on the next office up, presumably.